The link below is to a V7 Sport in Canada. I'm considering it but would like some expert opinions on what you see from the pictures. I know some late bikes came with dual discs, but should this one (1973) have a drum? 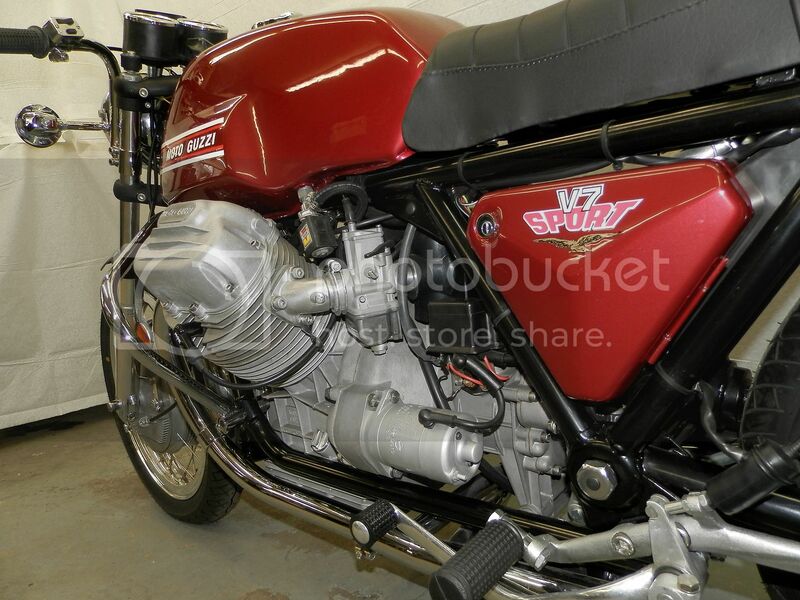 Owner also talks about including the right-hand shifter parts...does this mean it was a European spec bike? Ad says nothing about replacement of the original chrome cylinders. Figure in the cost of that, and hope the chrome hasn’t flaked into the engine. Better off with this one. Same Arveno that’s a member here? 73 should be a drum, generally right foot shift, that looks like a later bike with the badge on the tank and discs. agree, this looks like a better deal. But wouldn't the Canadian one be a better deal if it's in Canadian Dollars? I have seen this bike advertised of and on for over a year. I prefer a drum brake V7 Sport over the dual disc. I wouldn’t call it concourse, signal lights are incorrect, alternator and horns are wrong. It looks to be original but it’s not excellent from what I can see. I would pay the US Dollar premium and take the drum brake bike.